People been asking me about: How did you shoot the milky way? or, What settings did you used to take the stars shot? So I want to put some information here where I can direct people to next time when people ask me similar question in the future. The Photographers Ephemeris – the original app that a lot of landscape photographers use, included myself. These tools give you some information like sunrise, sunset, moonrise, moonset time and directions. How high from sea level with the location. Full moon, new moon, etc. There are also other free apps that give you some of the information I mentioned. But might not be all in one place. Oh yes, you might want to download app that give you the milky way location like Star Chart. It is an iPhone app, and I’m sure there are other apps on other platform that’s does the same thing!! Okay, so now you have your location set, tools you need to check the sky if it is dark enough for shooting the milky way. And the best would be a moonless night. With a moonless, you can have a dark sky and a better results with your milky way photos. So you pick the time right, get to the spot. Pick out your camera, the next thing that you will ask is: How do I focus? Because you are at a very dark location. And there will be nothing to show, both on your screen or in the viewfinder. So you should find a day time with good lighting. And try to focus to the distanced objects to find out your lens focus point to the infinity objects (ideally mountains far away). And keep that mark in mind when you go out night shooting. Now it’s time to talk about the lens choices. As simple as the wider the aperture the better, because it will let more lights into the lens. But you should also consider the focal length as you are trying to capture the milky way. The complete picture of the night sky! You really need a wide angle lens. I mean anywhere from 24mm and lower. Of course the lower the better, wider. But it will also get curve distortion as you go lower. Also there are different between using a Full Frame, or Crop Sensor Camera. And the wider the lens, the longer you can expose. 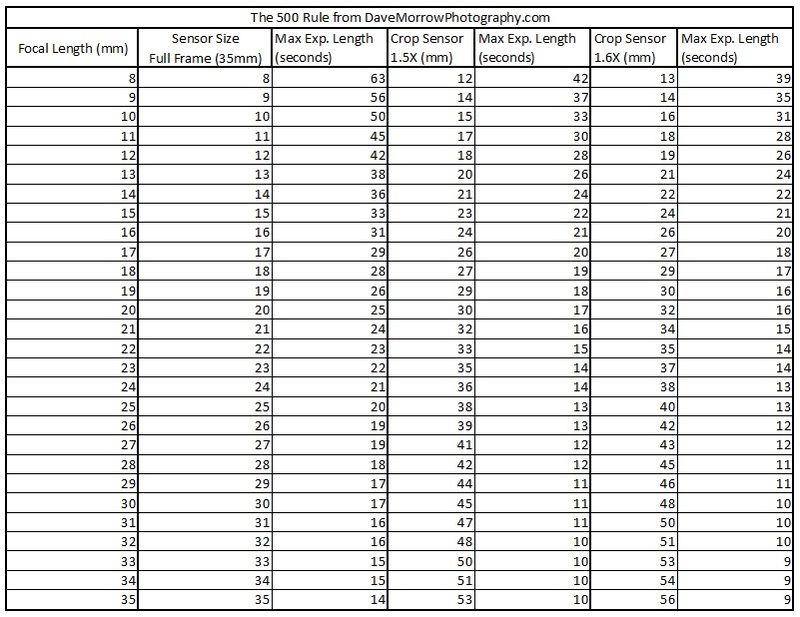 Here is a great resource from Dave Morrow of “The 500 Rule”. Follow this rule and you will not be getting star trail base on the lens used and the type of camera. And you might have heard of some people said is called 600 Rule, of even 450 Rule. I will have my next post about that together with “How to Shoot Star Trails Photography”. So now let’s talk about the camera settings. Ideally a lens with a f/2.8 is great for night photography, but I’ve used f/4 on a FF camera with ISO up to 10000. Or a f/3.5 lens on a crop sensor camera with ISO 1600-3200. I alway try to stay below 3200 on my crop sensor camera since the noise will get pretty out of control when you go above. When I get to a dark location, I’ll usually take a test shot using: ISO1600, f/2.8, 25-30 seconds depending on the lens you are using. And from there, then I can decide to go up or down with the current settings. Also it is important to zoom the photo to the largest you can and see if they are in focus. And likely you will start to find the right framing for your shots. After a few shots, your eyes should now get used to the dark environment and can see more and more clear with how many stars there are in the sky! If you haven’t found your milky way yet. You can take out your Star Chart app to check it, it works with the GPS, so even you are at a remote location without phone service. You can still use this app! 🙂 Well…. If you have a time and location set before you start your trip, you can use Stellarium on your computer to find out what time the milky way is up at the location you are going. That way, You know exactly what time you should head to the location. Hope these info can get you start your first planning / shooting out in a dark location! I last thing I like to add-on before you go is to remember to shoot your photo in RAW, and don’t just use JPEG. Yes, you can still capture your milky way using JPEG format. But Raw file will always give you that extra range that you can use when it comes to post-processing. Will see you another time when we look at post-processing!! What a great resource! Very kind of you to make all this available. You are very welcome! Rany!! thanx dear,,i hv to try this..